This week I thought I would write about how beneficial it is to work closely with Occupational Therapists (OTs). I’m so fortunate to work with the OT on my team. She is amazing and we are always collaborating, planning and problem solving. The majority of OTs, I’ve worked with are very passionate and hard-working. Here are my reasons why working with OTs is important. OTs are problems solvers and SLPs are too. It’s great to toss ideas back and forth about the tricky child(ren) in the classroom. It’s good to get a different perspective on a child/issue. With more and more children it seems that their difficulties are not “just” speech/language or “just” fine motor/self-help/emotional regulation. It’s frequently a combination and, at times, you can add in physio and cognitive difficulties too. We often collaborate on potential goals for the children. Using a team approach, the children receive more effective services and in the long run makes everyone’s job easier and the children are happier and healthier. OTs are often masters at helping children, who are struggling with attention, sit and focus longer on an activity. They can often find ways to help those children beyond the basic timer, fidget toy or special cushion. If the child can focus longer then they can learn more which will make them stronger communicators. We can make OTs lives easier too. There is vocabulary that helps them do their job more effectively. Teaching body parts and what they can do is important for self-help skills and it helps with drawing skills. Teaching emotions helps the OTs when working on emotional regulation and social skills. Words such as big, little, long, straight, curve, top, middle, bottom, corner, above, below, under, same and different are important when teaching children how to form their letters. I will often check and see if the children have that vocabulary and if not I will frequently target those words in therapy. This year there are a lot of children with feeding and swallowing issues on the caseload. I tend to focus more on swallowing part and she tends to focus on the feeding part. We are constantly talking about how this child is eating/swallowing and what they are eating. It’s always better to have a second set of eyes, especially when we typically don’t see a lot of feeding and swallowing issues. In the last few years there has been a real shift towards teaching social skills and skills that allow our children to function more independently in the classroom. This is another area where our expertise can overlap. It has been very beneficial to team teach a lot of these skills. Having access to different games and information being provided by two different people on different days has been immensely helpful to the students. OTs are invaluable when working with children who use AAC. As one OT put it, when we were chatting about different communication systems, “My job is to help children be able to learn motor patterns to allow them to communicate.” There is a lot that goes into the physical act of pointing. As well, they are very helpful when making sure the communication device is more accessible. I have not had much training in this area and I’ll admit this is not my strong suit. If not for the OT, many children would have had a much harder time accessing their communication devices. At school, we try very hard to make all the AAC appointments together so that we don’t accidentally miss anything. When you have a chance to work with an OT go for it! I’m so happy that you posted this, Collette! 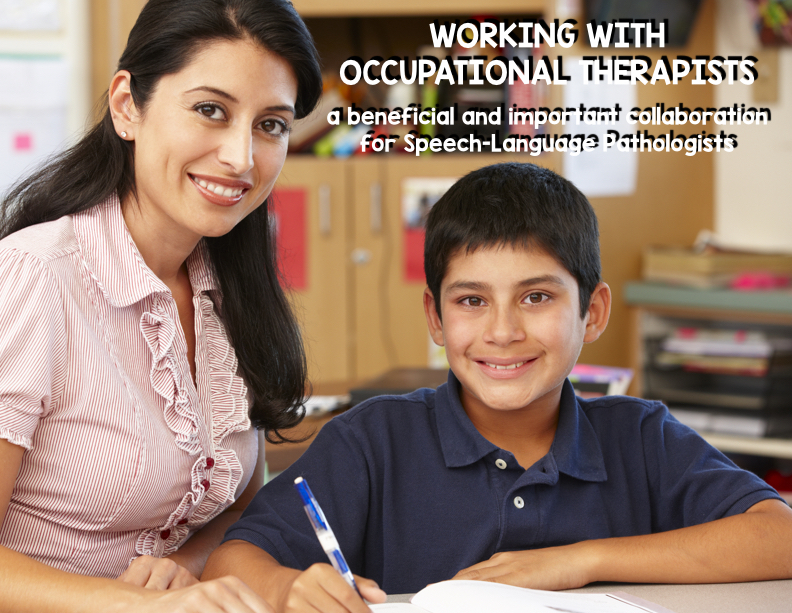 I have learned so much from working with OTs and PTs, with the children benefitting from our collaboration. Treating the whole child is definitely the way to go! I love working with OT’s! If a students sensory needs aren’t being met, it’s pretty tough to get him to function on speech and language goals.